Self-Explosion: Nitro possesses the superhuman ability to literally turn himself into a living bomb. Nitro can blow up his entire body at will and exists in a sentient, gaseous form until he reconstitutes himself. Typically, Nitro's maximum blast force is equal to about 250lbs of TNT. However, while taking Mutant Growth Hormone, his power was enhanced far beyond his original limits, sufficient to level the city of Stamford, Connecticut. Robert Hunter was an eccentric retired electrical engineer who operated a ham radio as a hobby. 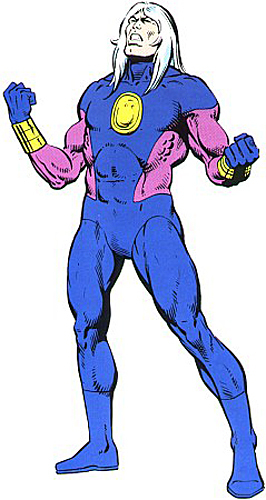 The Lunatic Legion, a band of renegade scientists of the extraterrestrial Kree, monitored Hunter’s broadcasts and chose him to become their agent. They took him to a hidden genetics laboratory and genetically re-engineered Hunter’s body to endow him with the power to explode his body’s molecules and reassemble them at will. Dubbed Nitro by the Lunatic Legion he was sent out to perform operations for them.